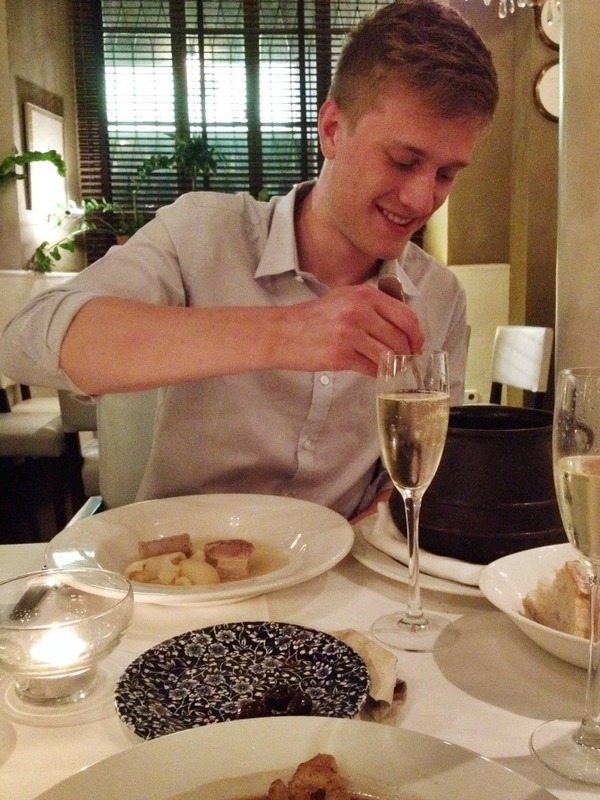 After the excitement of graduation was over I couldn't wait to make the most of my second last long student summer and pop off on a little city break to Barcelona. I'd only ever been to Spain once before when I went on a little girls holiday to Marbella where we stayed in a golf resort so I'd never particularly experienced the culture or the food there so I was really excited to explore another little corner of Europe! So Jonty and I scuttled off for four days of sun, sightseeing, sangria, gins and a whole lot of paella. This girl likes rice. 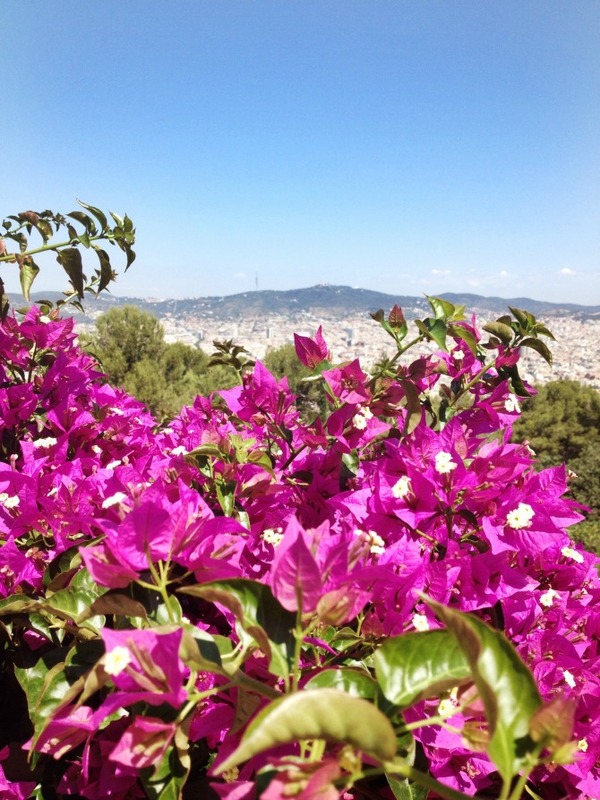 Instead of going through each of our days there I thought I'd chat to you about the best way to do 4 days in Barcelona and all the little finds and tips and tricks we picked up and perhaps the things we'd do differently if we went again. First things first; buy the Lonely Planet pocket travel guide. It's so cheap on Amazon and totally invaluable for hints and tips you wouldn't find on the official websites. It's also good to find restaurant recommendations in certain areas as there are dedicated area sections in the book. Tip numero 2; if you're on a tight time schedule, plan what you want to do and see in advance. You're looking at the two mugs that didn't do that and spent a few good hours puzzling out how to get places and what we actually wanted to do and ended up not being able to see everything. Cleeever. So first things first, where you going to rest that head? Another thing I was excited about trying for the first time was staying with Air BNB. When looking for somewhere to stay in Barcelona we couldn't believe how expensive the bog standard hotels were and after an expensive graduation week we didn't have all that much mulla to spend. As a couple we also weren't that keen on staying in a hostel as we didn't suspect they'd be particularly relaxing. Luckily my cousin and my friends Rhona and Ranald (who are currently travelling around America staying in some pretty snazzy Air BNB's - you can watch their vlogs here) recommended this slightly unconventional accommodation! There was plenty of choice in Barcelona and all at the most reasonable prices! We ended up staying with a lovely French lady (ironic) called Violaine who had a lovely apartment in an area called Barceloneta which means 'Little Barcelona'. We chose this apartment as it was slap bang between the beach (which was about 15 minutes walk one way) and the city centre and La Ramblas (15 minutes walk or one stop on the Metro the other way). We were planning on doing a bit of beaching and sightseeing so this was the perfect little hub for us in the middle and meant we could walk everywhere if the boiling weather allowed! We had a bright spacious double bedroom in her house with a sofa, a little balcony, a desk, towels and lots of storage and use of her bathroom and kitchen whenever we wanted. She was also there to greet us and give us the lowdown of the best places to see and things to do and it was good to know there was always someone there to help who was local if we ever needed her. Our host worked quite a lot so we still got plenty of privacy and it pretty much felt like we had the place to ourselves! We also felt really safe in her home and feeling like that especially in a city like Barcelona is not something to pass up! I would highly recommended staying with Air BNB as it's such good value for money and gives you a better feel for the place rather than staying in a hotel. 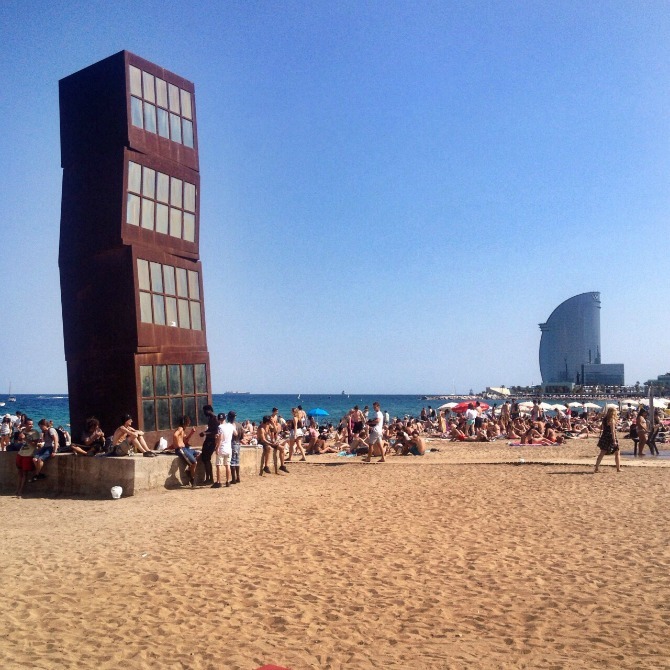 Also the Barceloneta area is pretty perfect for a short trip like ours where you want the relaxing holiday as well as the sightseeing! To keep your belly full (and believe me that's dead important in my book) Barcelona is definitely not short of nice eateries. Literally everywhere you walk there are cute little rustic tapas bars, bigger chains or in some areas some cool eclectic modern restaurants and bars which I wasn't really expecting. The places I would however steer away from are the ones that have photos of their dishes on the big menu boards outside - never a good sign or if you're on a slightly tighter budget like us, the restaurants right on La Ramblas or right at the harbour at Barceloneta. Those are top tourist areas and therefore the price is bumped up hugely. Our favourite little finds over the 4 days were ones we came across while wandering. This is one thing we decided we'd definitely come back to Barcelona for as we were constantly spying new places we wanted to try and didn't have enough time! My top recommendations are Meson Barceloneta, obviously in Barceloneta, for paella. This restaurant is a little nicer than the others along the harbour and is clearly run by a family - the mum is an absolute star. It has gorgeous little fairy lights across the outdoor seating area and they serve the tasty paella (of which they do a chorizo and chicken version for the none fish indulgers like myself) up in front of you. They also do pretty hefty gins, nothing like the scooty wee 25ml measures you get in the U.K. This restaurant is a bit pricer than the others we ventured to, but it was our last night and you get good food with a relaxed atmosphere and a lovely view of the harbour. It is pretty hard to get a seat however but worth the wait. Another great find in Barceloneta is Black Lab. It's not the most Spanish food you'll find but if you're wanting a break from the calamari and patatas bravas it serves up probably the best burger I have ever ever had. Pretty big statement but it's all true. They also do really tasty beer cocktails (with craft beer brewed by themselves), something I'd never thought to try before and they're pretty darn delicious. My final foodie favourite was Senyor Parellada. This beautiful Catalonian restaurant recommended to us by Jonty's cousin's wife who is from Spain. 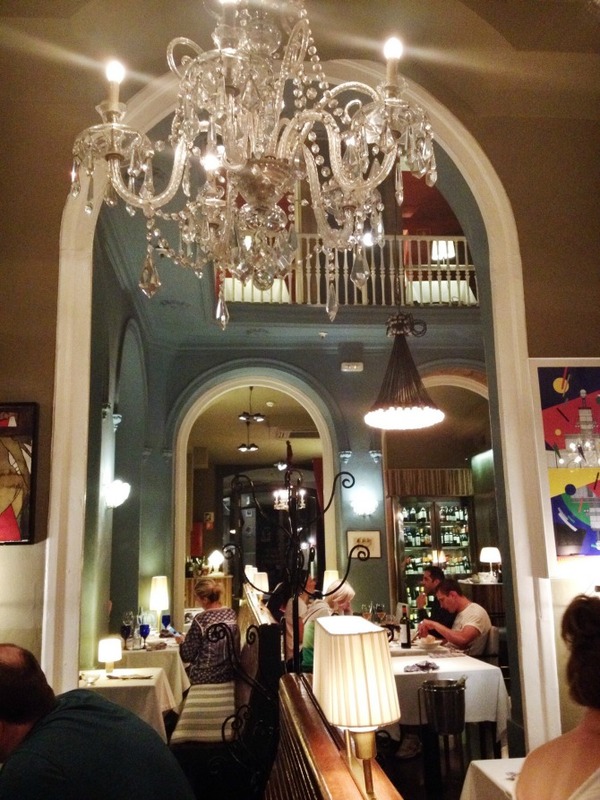 It is right in the centre of Barcelona in the area called El Borne on a street filled with amazing restaurants. It is quite understated on the outside but the most beautiful restaurant on the inside. We were served by the funniest little Spanish man who had the most impeccable service skills and also the most delicious Catalonian food. I had the seasonal vegetables (asparagus, courgette, carrot etc) in a light batter to start and Jonty had the local grilled shrimp which had just come from round the corner. I then had the veal casserole which was honestly so delicious and Jonty had the huge Catalan stock pot which could probably have fed a small family. This huge meal (I warn you the portions are massive) was washed down with an 8 euro bottle of cava which we were more than excited to get in it's posh ice bucket when we heard the price. Total cheapskates! We couldn't believe how good value the meal was, how delicious it tasted and what a wonderful setting. What set it off for us was after sending Jonty's cousin's wife a photo of us having dinner there she replied telling us that's where she got proposed to - so it really was a special little place in Barcelona and I couldn't recommend it enough. The first journey you make will be pretty easy. To get from the airport into town there is no better way than getting the airport bus. They are every 5 minutes from the front of each terminal and you can buy a return for about 10 euros. They take you right into the centre of town in about 25 minutes and there's also free wifi and plugs on the bus if you want to let your fam know you've arrived safe. Once you're there the best way to get around is either on foot or on the Metro. Until I went to Barcelona I was pretty nervous of subways. I don't get claustrophobic but I've never really felt very safe on them. However, Barcelona's Metro is so quick and easy and totally dispelled any fears I used to have. It can take you from one side of the city to the other in a matter of 10 minutes. The most cost effective way to do it if you are there for a few days is to get a 10 ticket which will cost you about 14 euros. This gives you ten different journeys on the Metro no matter how long your journey is. You can also do pass back with it (it's perfectly allowed) if you are a couple and don't think you will use 10 yourself although with so much to see and do in Barcelona it's very easy to! Also if you're a traveller and only in Barcelona for the day Locker Barcelona is a great and cheap place to store your stuff. Now, the biggie. I am very into art, but only doing it myself. I'm not the biggest fan of trailing around art galleries, especially when it's a glorious 29 degrees outside. So we decided to stay away from the museums and art galleries but if that's your jam there's plenty for you. The one thing that everyone says you have to do in Barcelona, and with good reason, is visit the Sagrada Familia. Whether that be for religious purpose or purely for sheer awe at beauty, man power and architecture it is an incredible sight which has to be seen. Top tip: without a doubt you should book online beforehand. We booked online for the 9:15am slot and it was already packed! I would also recommend getting an audio headset as you would never notice half the detail otherwise. Another great thing to do is wander down La Ramblas (be careful with your stuff - keep your valuables in a bum bag or a rucksack on your front) and take in the atmosphere. There's also a great market just off La Ramblas called La Mercat de la Boqueria which has the most amazingly colourful sights. It is literally a photographers dream. It's also so worth getting the funicular then the cable car up to the top of Montjuic. 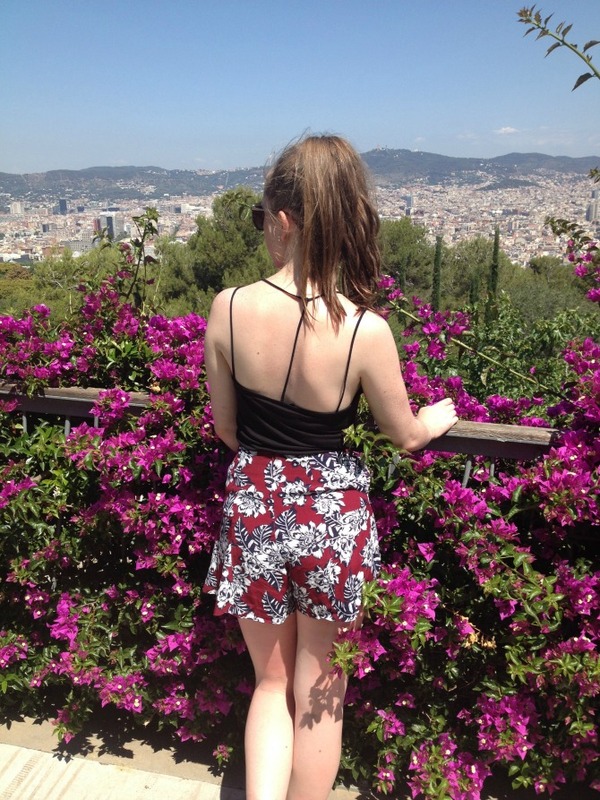 It has the most amazing views of the whole of Barcelona as well as so many things to see on the way down. You can visit the castle at the top, potter about the botanic gardens further down, go and visit the Olympic Stadium and the diving pools or go into the Olympic museum. The beach is also worth an afternoon visit. There are a few areas of sun loungers but most people tend to just pitch up with a towel. For those of us who are of the pale and freckly kind you can hire umbrellas from some of the lounger providers but it can be pricey. We just grabbed a parasol from one of the little beachy shops for 15 euros as we went to the beach every evening and left it with our host at the end of the holiday. A final little tip - if you're into your clothes shopping you have to go into the massive Pull & Bear stores. We don't have Pull & Bear in Scotland and it is the stuff of dreams. I could have bought everything in the shop. It totally reminds me of a mix between Forever 21, Topshop and H&M but with very reasonable price tags. I wanted to bring the whole shop home. There were so many things that we ran out of time for in Barcelona, such as visiting Park Guell but hey maybe we'll go back sometime. 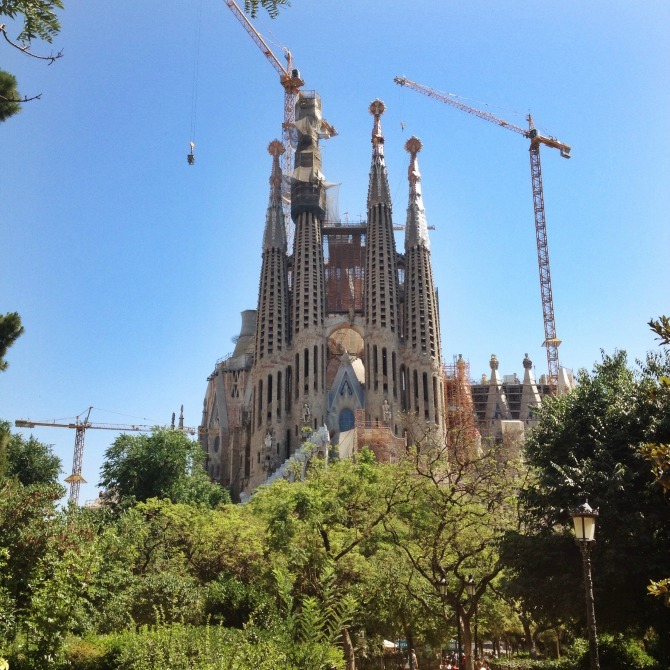 Perhaps when they've finished building the Sagrada Familia! I absolutely loved the mix of beach and city holiday and there was always so much to see and do that you could never be bored (or hungry)! 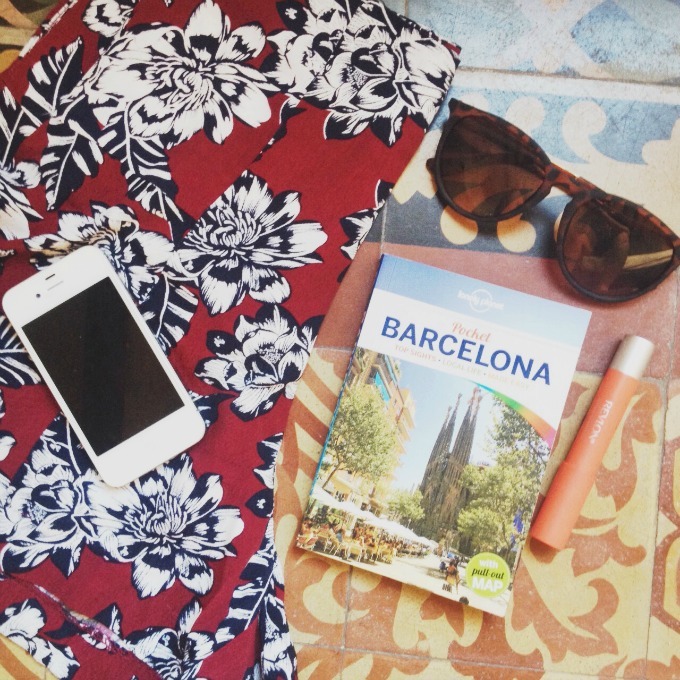 Have you ever been to Barcelona? What were your favourite things to do? Sounds wonderful. Hopefully we will get to visit there someday.